Very fast, user-friendly and suitable for overhung locking or wall mounting - the new interlock system for RobiFix. Multi-Contact has developed a new standard for robot dress packs for spot welding. The RobiFix primary circuit connector provides power supply in the dress pack with single-core cables, and is particularly compact, installation-friendly and cost-effective. New accessory parts now round out the system and extend its possible applications. 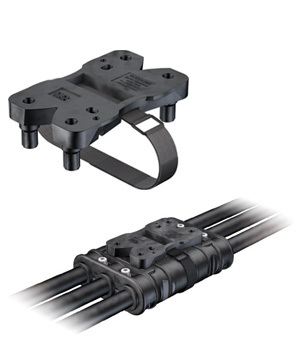 With RobiFix-LOCK, the connector can easily be fastened and/or locked. On the one hand, this permits a welding robot to be fastened to a mounting plate, for example. But on the other hand, the RobiFix-LOCK is also used for overhung interlocking of the plug connection in manual welding gun applications.